They say a rolling stone gathers no moss. If that rock is in a rock pool though, does that mean it gathers no life at all? Maybe not. Next time you are down the beach and you spot a rock pool go over and take a look. Pick up a rock and take a look. Nope, that's not dirt you're looking at - that's life! Let's take this rock for example. All that stuff on it is life. Let's take a look at just two of the species - the chiton (A) and the keel worm (B). Even the humble rock becomes a home for sea life. 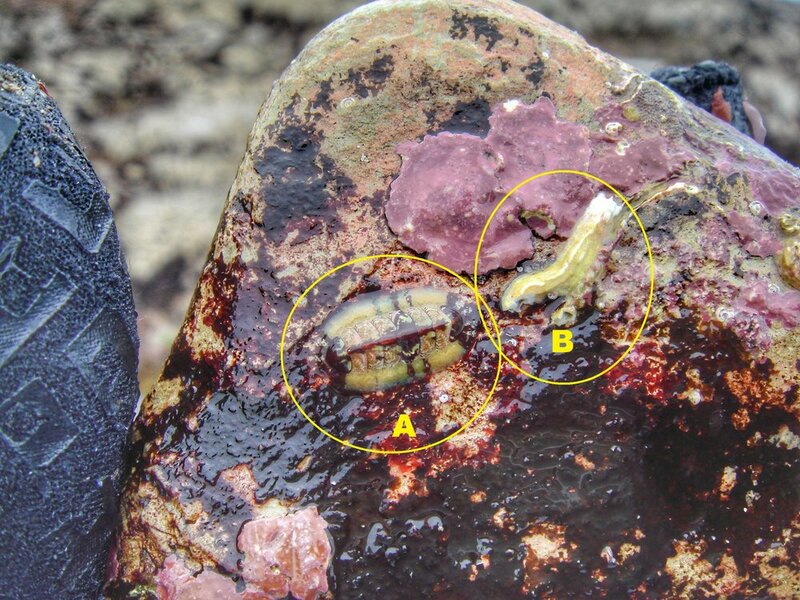 "A" is a chiton and "B" the cast left behind by a keel worm. Credit Samantha Andrews/Ocean Oculus. Chitons are remarkable creatures. They can be found in the sea around almost any coastline of the world that is rocky. Their shell which protects them from predators (and probably from being thrown around on rocks) is rather clever. It's composed of 8 pieces which allows the chiton to bend itself around rocks without leaving gaps - or into a ball, which is quite useful during those times they do get thrown off the rocks they cling to. Under that shell is their soft body - but it's a little different to us. Like snails and slugs (which they are related to), they have a large foot that they can cling to surfaces with (important when living in a rock pool - waves and tides can make staying in place pretty tough! They don't have a head as such, but they do have a mouth. Chitons are herbivores with a liking for micro-algae attached to rocks which they scrape off with their radula - kinda like a tongue but with rows of teeth coated in a hard ferrous oxide mineral that is perfect for scraping food off hard rocks. Keel worms like this Pomatoceros triqueter which is commonly found in rock pools in the eastern North Atlantic, look a little different to the terrestrial worms that you might be familiar with. First, they have feathery-like tentacles that they use to grab tasty morsels in floating in the water with for dinner. Second, they build themselves a hard protective home that it lives in. That's actually what you can see in the photo. These clever worms make their home by secreting calcium carbonate that they collect from seawater. The pièce de résistance of the keel worm's home? It has a trapdoor that closes when the worm pulls itself back in.